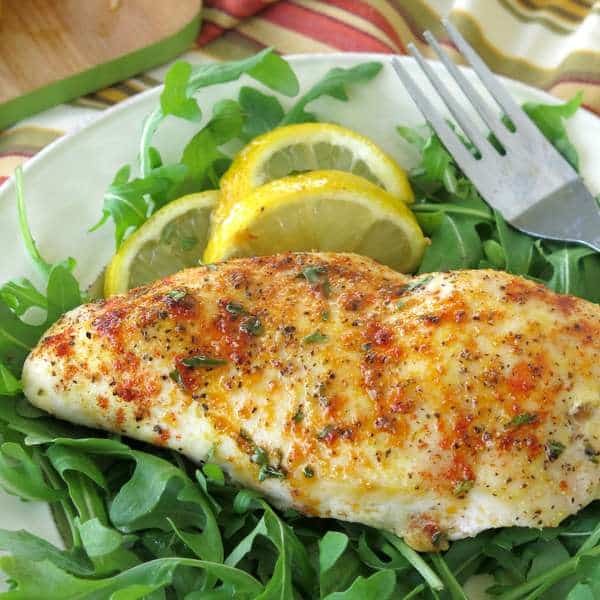 Incredibly flavorful and juicy Baked Lemon Pepper Chicken is low-carb, gluten-free and takes MINUTES to prepare. Sit back and relax while in cooks! This easy, low-carb and healthy chicken recipe will become a staple at your house. It’s basically the same recipe as our super popular Lemony Baked Basa and Lemon Pepper Tilapia, except that we used chicken instead. The appeal of both recipes is the ease of preparation (we’re talking about 5 minutes) and the delicious lemony flavor. This is a classic bake once, eat twice recipe that is very, very versatile. We love these two concepts so much! Here’s why. Scenario: You’re on your way home from work and don’t have a dinner plan. First, you literally do not have to know anything more. Just pull the chicken out of the refrigerator and get it cooking ASAP. It’s not a 30 minute meal exactly. But, it comes close and it is all hands off cook time. While it bakes you have some quick decisions to make. We have your back with lots of ideas below. 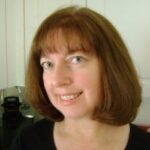 Second, while you are at it, make extra chicken so you will have leftovers and can make recipes like Layered Chicken Enchilada Casserole the next day! Happy Ending: In about 35-40 minutes, you have 2 or more dinners and possibly lunches ready to go. I’m a big fan of making a dinner plan. But, this happens at my house all the time. Now, I just plan on it! Another recipe that works the same way is Baked Blackened Chicken Breasts. It’s popular with fans of spicy! 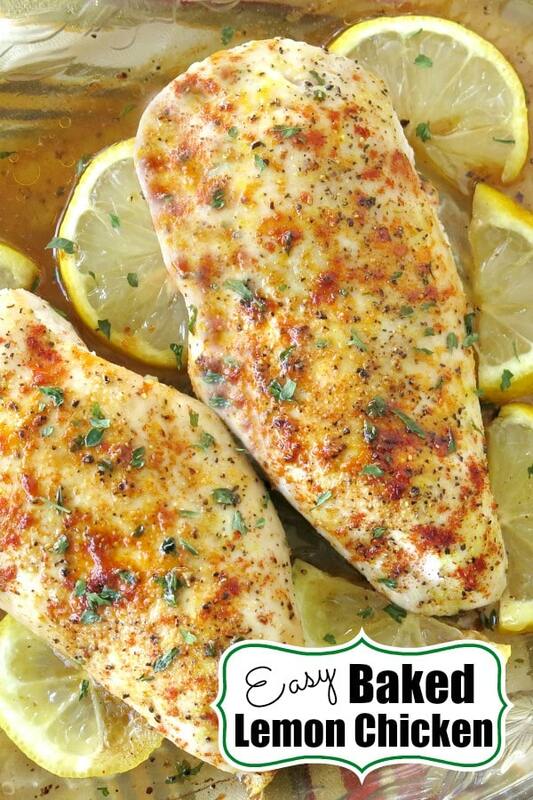 How do you make Baked Lemon Pepper Chicken? 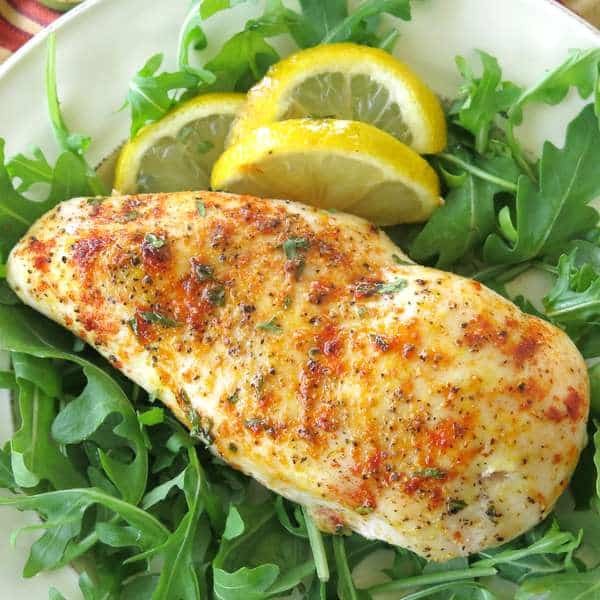 Simply splash some lemon juice over the chicken, sprinkle lemon pepper seasoning, garlic powder and paprika over each piece of chicken and place a sliver of butter on top. Bake in a 350 degree F oven for about 30 minutes. The beauty of this recipe is the simplicity of the preparation. We’ve provided the measurements in the recipe below. But, the amounts can definitely be eyeballed. Of course fresh lemon is best. But, we keep a bottle of lemon juice in the refrigerator and it works just fine. The pat of butter helps create the lovely juicy top and makes the chicken moist and delicious. We used a scant teaspoon of butter per serving and it is well worth it. As for those little green specs you see…that’s dried parsley and it is entirely optional. So are the lemon slices. Use these ingredients to up the presentation. How do you make Lemon Pepper Seasoning? To make your own lemon pepper seasoning, you will need to zest several lemons, dry out the zest and then combine it with mashed black peppercorns, salt and other spices such as thyme or minced onion. I’m 100% behind anyone who is up to the task. If so, check out this recipe for Homemade Lemon Pepper Seasoning. Or, buy a jar to keep on your spice rack, which is exactly what I do! In addition to seasoning chicken and fish, use it to liven up vegetables. Sprinkle it on before or after cooking. Note that depending upon how much salt is included in a blend, you will not need to add additional salt to the recipe. What do you serve with lemon pepper chicken? Lemon pepper chicken is very versatile. Simple sides such as green beans, asparagus, broccoli, zucchini, new potatoes and carrots will easily round out dinner. Many of these vegetables will cook nicely alongside the chicken too. Other ideas include serving it over salad greens, couscous or Curried Cauliflower Rice. I absolutely love this recipe because it is such an easy way to add healthy protein to your diet. Dice chicken and freeze it to up the protein content of meals. It’s perfect for South Beach Phase I diet and it’s keto friendly too. Tag @DinnerMom or #DinnerMom on social media if you make this recipe. We love to see what you are cooking up! We have included Amazon links to products we used in making this recipe. If you click on a link and buy something we will receive a small commission that supports the operation of this blog. Thanks for shopping! Place chicken in a baking dish. Sprinkle with salt and pepper to taste. 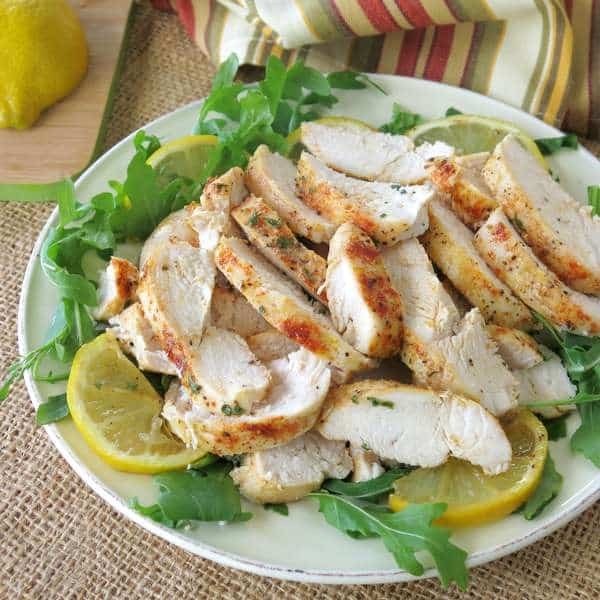 Gently spoon lemon juice over chicken. Sprinkle remaining ingredients over chicken. Place butter slice on top of chicken. Bake uncovered for approx. 30 minutes or until chicken temperature registers 165 F and juices run clear. Spoon juices over chicken, if desired. Garnish with parsley and serve with lemon slices, if using. Use a meat thermometer like this one to ensure that chicken is fully cooked, but not overdone. Using a thermometer is my number one tip for perfectly cooked meat! Pin this to your Easy Chicken Dinner Recipes board on Pinterest! I loved the Basa recipe so I knew this one would have to good too…and it was. Love it and always make extras. Thanks! Thanks for your comment! It’s a very versatile recipe that’s for sure! Thanks so much for your feedback! I’m so glad you enjoyed it! What if you swap Olive Oil for butter? Are there less calories? Does it still taste the same? Hi! There are slightly more calories in a teaspoon of olive oil (about 40) as compared to butter (about 34). Since lemon is the primary flavor, it should shine through either way. I’d love to know your thoughts if you make it this way! I’m making it right now with olive oil because my son is allergic to cows milk andhe can’t have butter. I have vegan butter but I’m not a huge fan of it. I’ll let you know how it turns out. making this for the first time oven is set at 350 degrees after 30 minutes the chicken hadn’t even reached 125 degrees with was meat thermometer. I hope it worked out. The cook time will vary depending upon how thickness of the chicken breasts. Also, it can definitely be cooked it at a higher heat for a shorter amount of time if desired.. If you don’t care for garlic then definitely leave this out. The lemony flavor will still shine! Hi, been using the foil packs for my chicken breast for a long time and I’ve also been using the ranch seasoning packet and butter and it gives the chicken such a great taste! I am extremely picky about my chicken because a lot of recipes that I have tried the chicken still is so Bland and it just tastes awful to me so that’s when I found the foil Packs along with the ranch seasoning packet and butter and my husband and I love it my question to you is with this lemon pepper and garlic recipe that you have does it give the chicken lots of flavor I just cannot stand to take a bite of chicken and it taste just extremely Bland I have to be able to taste the flavoring that I made it with sorry don’t mean to sound so forward thank you! Hi! If you like lemon flavoring, then you should enjoy this recipe. The flavor profile will be completely different from the recipe you made with ranch dressing (which sounds delicious!) 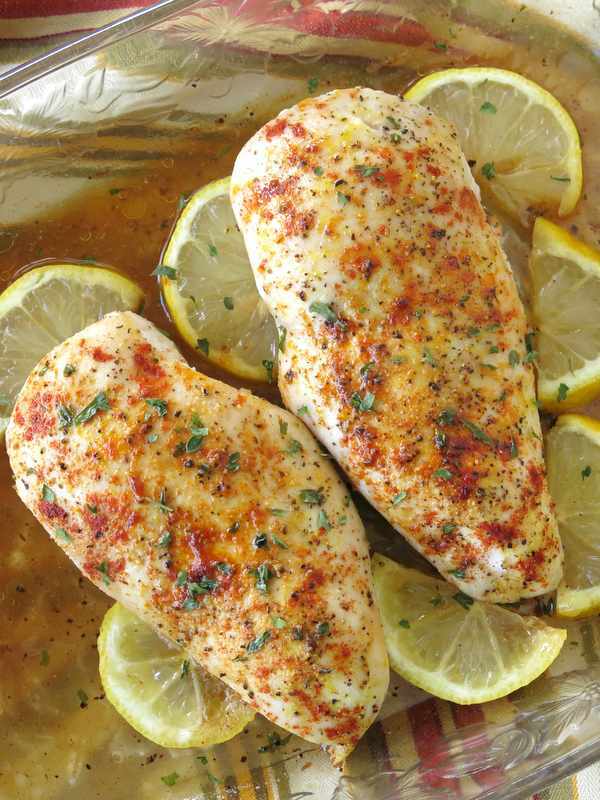 Note that lemon baked chicken can also be made in foil packets. I hope you enjoy it! thank you for your reply back to me if I use the foil packs with this recipe do I still need to leave it uncovered? or is it okay for me to just cover it completely up like I would if I were making the ranch foil packs? what I’m thinking is it would have much much more intense flavor if I just kept it covered up and closed thank you and by the way if you would like the recipe for the ranch and butter chicken let me know I would love to send it to you. Cook it the same way that you prepare the ranch chicken, completely covered. Would love the recipe!!! This recipe was delicious! Didn’t change anything and it cooked perfectly. Served it with green beans and cream cauliflower. Thanks for the recipe! Thanks so much for your comment! Love your sides! I can’t believe I read all of that, but I did… and now I’m totally SOLD on the recipe and the FOIL PACKETS!! Haha. I’m a husband, to a wonderful wife and mother and she loves when I surprise her with lemon pepper chicken and asparagus. But I’ve never tried it with fresh squeezed lemon. And I love that idea. And the packets marinating it. I’m on it for a surprise lunch tomorrow. Thanks ladies. Thanks so much for your comment! Terrific tip to add asparagus to the foil packet. I would LOVE to come home to that! Enjoy! My family raves about this chicken!! It was scrumptious!! !